Last week I wrote about the Global Entry – the government’s expedited immigration program for frequent travelers – $100 fee being waived by American Express for Platinum Cardholders. Even though I paid for my Global Entry application before the benefit went into effect, I was still happy to see Amex adding benefits to the Platinum card. While the card does have a $450 fee, if you are a somewhat frequent traveler you can easily get many more times that amount in benefits because the Platinum card gives you valuable perks like lounge access to American, Delta, US Airways, Alaska, a bunch of international independent lounges (and United/Continental until September 30, 2011), $200 in airline fee rebates, Starwood Gold status, Hertz benefits, hotel upgrades, concierge service, the above-mentioned $100 reimbursement for Global Entry and much more. And for a limited time you can get 25,000 Amex bonus points for getting a Platinum card. But back to Global Entry, I had heard a ton of amazing things about the program and how much time it can save, but I never gave it much thought. I’ve been lucky to usually fly business/first class internationally, so whenever I have to go through immigration, I’m one of the first people there. Except when a couple weeks ago I got caught in a 40 minute line – and nothing is worse after an 8 hour flight in coach then to have to snake through a line to get let back in your own country. So I decided to get Global Entry and skip the headache. 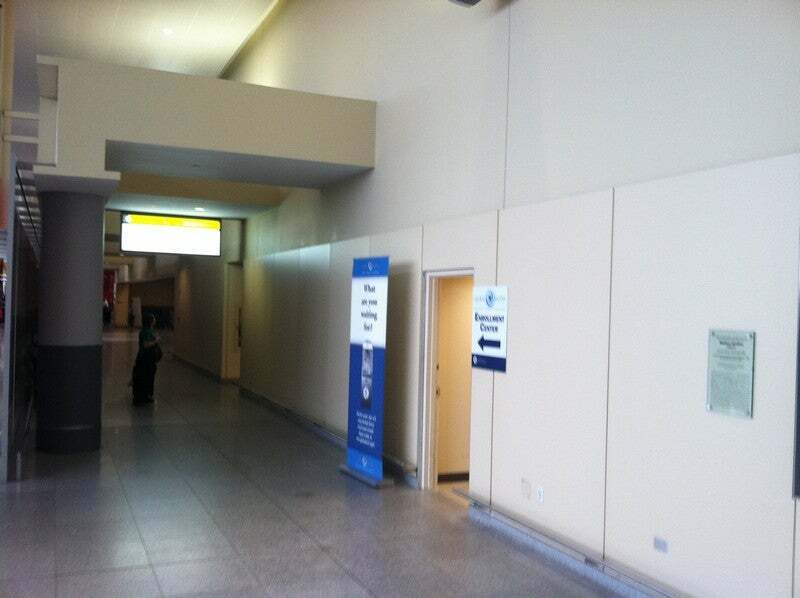 The Global Entry application office at JFK is in Terminal 4 main hall, so once off the AirTrain I simply went to arrivals and into the main lobby and saw the marked-off office. When I entered exactly at my appointment time they couldn’t find me on the list, which I knew was silly because the day prior one of their officers called me on my cellphone to confirm my appointment. However, after 4 minutes of awkwardness, they finally found my name on the sheets – having completely missed it. Fortunately, the interview wasn’t awkward at all. It mostly consisted of verifying key information, which I didn’t have a problem doing. Then for about 10 minutes, the agent showed me how to use the kiosk (scan your fingers, take a picture and take your piece of paper to get through customs). I once had applied for NEXUS (Canadian/US priority immigration) and I never had the time to get the actual pass. Apparently, if you have NEXUS you can get Global Entry for free – just another way to save on the process. 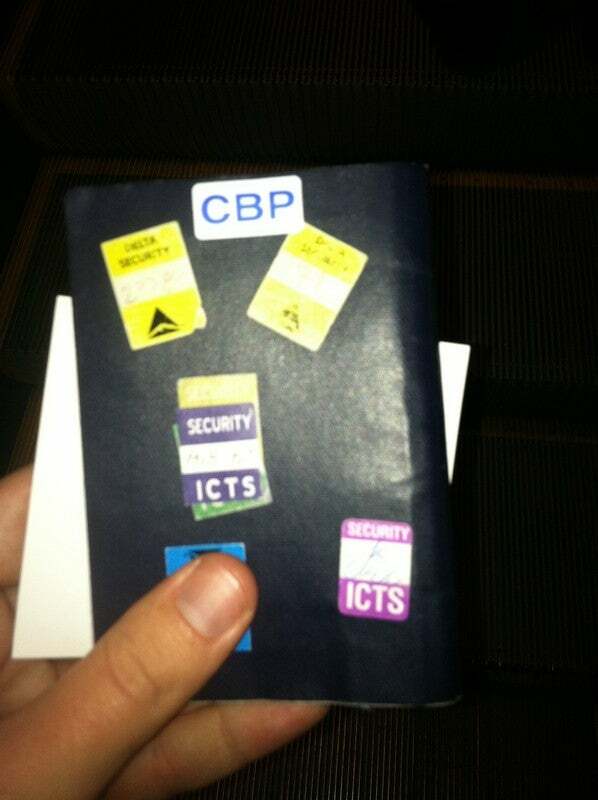 With the CBP sticker on my passport I was looking forward to going through immigration and cutting the line – and that’s exactly what I did. Once I entered the immigration hall, I asked an agent working the room where I should go. They said, “Go in front of each lane and head to lane 16.” I did just that and felt a line of daggers in my back since everyone else had been waiting for 30+ minutes to see an agent. When I arrived at the Global Entry kiosk, no one was there and it took 45 seconds to get processed. You simply let the camera take a picture of your face (I have to awkwardly bend down because I’m too tall), put 4 fingers on the pad so it can scan your prints and then it automatically pulls up your flight information and you just verify that you don’t have anything you need to declare. Once you are cleared, it prints a piece of paper that you give to the customs official (there’s even a separate line for Global Entry for customs) and you are on your way. The whole process took under 120 seconds- I have to say, my friends were extremely jealous that I was nearly home in my apartment by the time they got through customs and immigration! Overall, the actual application and implementation of Global Entry was a huge success for me and I highly recommend it if you are a frequent traveler. Feel free to comment below about your Global Entry experiences.